By Prince Dornu-Leiku: George Ashie (23-3-1, 16 KOs) is calm and calculating, patiently waiting for Saturday November 10, 2012 when he mounts the ring than blab now of what he has up his fist for rival Emmanuel Tagoe, 18-1, 8 KOs. Ashie, nicknamed Red Tiger is promising to discipline Tagoe who goes by the alias Game Boy but will talk no further pointing out that the ring will determine who the true champion is. “No problem at all. If he talks, it doesn’t mean he has fought already. Boxing is in the ring, not by talking so if the day is finally here, we shall all see what he can do. Let’s pray that the day of the fight does get here, that day has not come yet,” Ashie has told the Ghana-based website www.sportsinghana.com. Former IBF Intercontinental and WBO Africa Junior Lightweight champ Emmanuel Tagoe on the other hand is so confident of beating Commonwealth Junior Lightweight titlist George Ashie when the duo face-off at the Accra Sports Stadium for the WBA International Lightweight title next weekend, so much he is setting the conditions Ashie has to abide by in order not to get completely humiliated. Both boxers held media gym workouts last week but as usual, it’s Tagoe who is talking tough as the countdown to the big fight is now less than a fortnight away. According to Sportsinghana.com, Tagoe has vowed to stop Ashie if he is arrogant on fight night but will be lenient by winning via a points’ decision if Red Tiger humbles himself. “I spar with my wife and I have told her not to be too hard on me because this is no big fight. Ashie is not somebody who can pose any problem for me. I’m aware of the round that his camp are predicting that he will knock me out but I want to tell the fans and referee to count it as knockdown even if I slip on the canvas during the fight,” Tagoe said, confidence in full glow. Ashie’s fans have apparently predicted that the Red Tiger will stop Tagoe by round 6 of the scheduled 10-rounder but the boxer won’t give out any predictions himself. Ashie insists the ring will do the talking for him come fight night. “I’ve fought credible opponents and it is not a matter of big talk but the fist will do the talking for me in the ring. 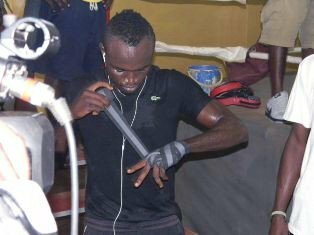 I’m fully fit and prepared enough to deliver so I’m calling on all my fans to come in their numbers and I promise to make them happy,” Ashie told www.sportsinghana.com after his media workout at the Attoh Qyarshie gym in Accra last week.